Washington analysts were fearful that President Trump would declare that the US was withdrawing from Syria at the Helsinki meeting with President Putin. President Trump made no important concessions to or agreements with President Putin on Syria. Although many suggested that some grand bargain might be in the works, little was said to clarify America’s policy in Syria. On Sunday before the meeting, National Security Adviser Bolton told ABC News that the U.S. was not going anywhere as long as Iran remained in Syria. “I think the president has made it clear that we are there until the ISIS territorial caliphate is removed and as long as the Iranian menace continues throughout the Middle East,” Bolton said. 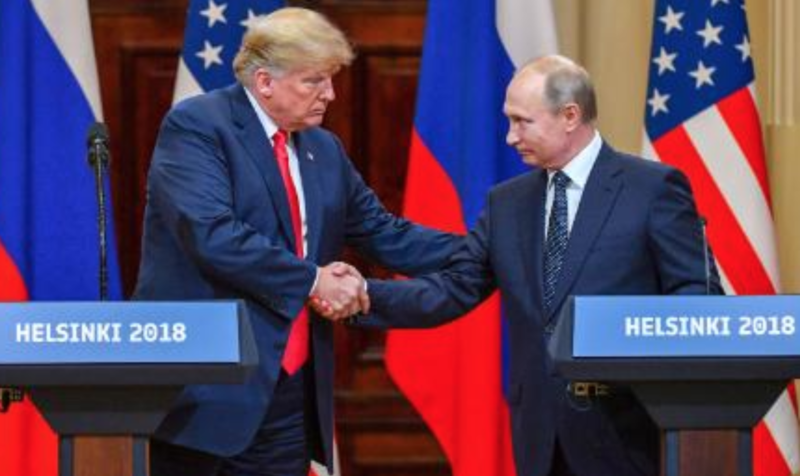 President Trump did say at the joint news conference after summit talks with Russian President Vladimir Putin. “We also discussed at length the crisis in Syria. Co-operation between our countries has the potential to save hundreds of thousands of lives.” But in order to allay the fears of those interested in rolling back Iran, Trump insisted that the U.S. would “not allow Iran to benefit from our successful campaign against ISIS (Islamic State).” This statement suggests that the U.S. will be maintaining its 2,000 special forces in North Syria for some time to come. Netanyahu “very much appreciates the security coordination between Israel and Russia and the clear position expressed by President Putin regarding the need to uphold the 1974 Separation of Forces Agreement between Israel and Syria,” the statement added. Most of the pronouncements about Syria from both Trump and Putin involved Israel. Both guaranteed its security and the 1974 Separation of Forces Agreement that Henry Kissinger helped to negotiate. This was good and bad for Assad. It was bad news for Assad because it means that Russia will do nothing to stop Israel from bombing Syrian military emplacements if Iranian officers or advisers are present in them. Indeed, Israel drove home this point the day before the summit by bombing a Syrian military base on the outskirts of the city of Aleppo. Nine Iranians and even more Syrians were killed. “We will not allow Iranian entrenchment within Syria,” Israel’s Foreign Minister said. It was good news for Assad because Israel and the United States have accepted that President Assad will stay in power and rule Syria. No effort has been made to stop the advance of the Syrian Army in the south of Syria along Jordan’s and Israel’s borders. To the contrary, both of Syria’s neighbors have expressed their readiness to accept the return of the Syrian Army; they are looking for a return to the status quo ante. That is music to Assad’s ears. President Trump made few commitments on Syria, but it is clear that neither he nor Russia can push Iran from Syria so long as President Assad needs and wants Iran’s help in defeating the rebels. Assad has stated that he will push both Turkish and American troops from Syria and take back every inch of Syrian soil. In this effort, Assad has explained that he will need Iran’s help. He insists that only he can determine whether or when Iran is to leave Syria. President Trump has repeated on several occasions that he wants US troops to leave Syria soon. His policy principals have walked back such statements. The problem with America’s position in North Syria is that it may quickly become a liability rather than a asset. Already fighting between Arabs and Kurds has erupted around Raqqa. Road side bombs have been planted, targeting US special forces. The inhabitants of Raqqa, the major Arab city in the north that was largely destroyed by US bombing against ISIS, are furious because the US is not rebuilding the city and has not committed adequate money for reconstruction. Ethnic and tribal divisions, the lack of jobs or money, and a serious drought in northern Syria are conspiring to undermine local stability and America’s leverage. President Trump and his foreign policy staff seem to agree on little about Syria; consequently little is getting done. Local inhabitants are looking to the US for answers. They want to know if the U.S. will guarantee their autonomy or even independence for the long haul. Should Kurdish authorities begin negotiating with Assad in preparation for a US withdrawal from North Syria? They want to know who is responsible for their future. The U.S. has set itself up for failure in northern Syria, not only because the region is likely to become ever harder to rule, but also because the U.S. has slipped into the role of champion of Kurdish nationalism in Syria. A mere 2.5 million Kurds live in northeast Syria; the region is the poorest and least developed part of the country; the U.S. is unlikely to get it to stand on its own two feet. What is more, Turkey and Syria are determined to prevent the emergence of a capable or independent Kurdish military. It will threaten the stability and authority of both countries. Trump has repeatedly said he wants to withdraw troops from Syria. He is right to look for a way out before an insurgency begins attacking U.S. troops. The U.S. must seek to secure a better deal for the Kurds within Syria. But to remain in the country for the “long haul” is to set America up for failure. Those who recommend a permanent U.S. force in Syria argue that it is an American interest to do so in order to roll back Iran, a state they describe as “malignant” and destabilizing for the region. They argue that America must deny the northeast and its natural resources to Damascus, not because they want to build a new state there, but in order to keep Syria weak and divided. A poorer Syria is more likely to become a quagmire for Iran and Russia: a state, they inexplicably believe will serve U.S. interests, not to mention those of Syrians and their neighbors. Unfortunately, even as Netanyahu, America’s closest ally in the Middle East, is assuring Russia that it does not seek to destabilize or topple the Assad regime, many in Washington are urging Washington to do just that. The United States and Western countries have gotten their policy in the Syria and the broader Middle East in a tangle. America needs to clarify its policy in Syria. It also needs to sort out its broader foreign policy objectives. The Helsinki meeting did little to help. America can’t clarify it’s position on Syria, just as it can’t anywhere else that it has invaded and bombed. As for paying for the damage, where does that come from? Taxes in the U.S. have been reduced, the savings going into the pockets of the elite, not into rebuilding the Infrastructure in the U.S. let alone in the countries the U.S. has invaded. The printing press are in overdrive, the debt of the U.S. is rising faster than ever, a true legacy to Trump. Though some say it will never, Trump is noted for bankruptcy as well as building his golf courses. This could be his last hurrah, taking the country down the drain. The Kurd:Arab ratio in Syria is almost exactly the same as the Kurd:Arab ratio in Iraq, as Fabrice Balanche (or the Institut Kurde) will instruct you. The only difference is that there is *no* going nationalist movement in Syria, no claim of independence, no separatism, no appeal for sovereignty, nothing. The claim that their is a “Kurdish nationalist” movement in Syria, is a race-generalization imported from Iraq: it is a statement about what “The Kurd” wants, akin to claims about what “The Jew” wants. After Afrin, the spreading of such false memes takes on the character of spreading generalized wisdom about ‘the Jew’ after Kristallnacht. Dear Rubin. What does Kristallnacht have to do with Kurdish nationalism? Didn’t Jews – or at least many Jews – embrace Jewish nationalism? Isn’t Israel a state and nation supported by many if not most Jews? Please provide numbers for the Kurdish population of Syria with sources. Even wikipedia provides 9% for the Kurdish population of Syria, a number taken from the U.S. Department of State. Census counts leading up to the 1960s, when enumerating by religion and ethnicity was still acceptable in Syria, uniformly give around 10% for Kurds and 12% for Alawites. Christians in Syria were about 15% in the 1940s but began to fall once Nasser nationalized businesses and took a nose dive after Baathists further tightened the nationalization policies and suppressed independent Christian schools that had been established by foreign missionaries. Today, Christians in Syria probably make up no more than 3 or 4%. Please provide the numbers you claim are true so we can actually have a discussion based on facts and not anger and accusation. You said there is bad and good news for Assad. But then what’s the bad news. You forgot to write the PYD is talking to the Syrian government about a deal and about the removal of portraits of Ocalan.